FORTUNE -- Money-management powerhouse Pimco has long been renowned for its expertise in bonds. Equities, not so much. So when the firm announced in late 2009 that it was moving into stock picking, it scoured the globe for talent. Its first draft choices were Anne Gudefin, a veteran value investor, and Charles Lahr, partners who jointly ran the $16 billion Mutual Global Discovery (TEDIX) mutual fund. During the five years Gudefin was at the helm, the fund averaged a 7% return, beating the MSCI world stock index by more than four percentage points annually and topping 98% of its peers during the 2008 meltdown. Gudefin, 44, a Londoner of American and French descent, eschews macroeconomic trends. Instead she seeks stocks trading at a 30% to 40% discount to their intrinsic value. 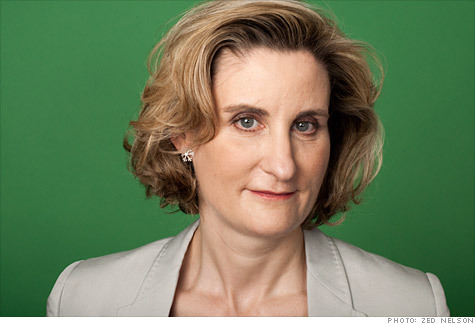 She discussed the holdings in her new $1.2 billion fund, Pimco EqS Pathfinder (PTHWX). Q. How do you decide a stock is cheap? A. I'm really attracted to good business models. We've seen over the years that quality pays, and I'm always looking for companies with high barriers to entry and strong free cash flow generation. I also want to see things that aren't operating perfectly at the moment, so there's a margin for improvement. I look for there to be a number of catalysts for value to be unlocked. Usually it's a new CEO in place, a restructuring program, or maybe plans to spin off or divest noncore assets. During the second quarter of last year we bought BP. Because everyone was so negative about it, we were able to buy very good assets at a very cheap price. Since then it's rebounded strongly, but we still think it's a value. A large chunk of your portfolio is in consumer staples. Why? There are very high barriers to entry: The consumer is attached to a brand. It's also a sector that has low requirements for capital expenditures -- generally somewhere between 3% and 5% of sales -- and the Ebitda margins can be in the mid double digits, so they have high free cash flow generation that they can use to pay dividends or make acquisitions. And they benefit from growth in emerging markets. We like Pernod Ricard, which is the No. 2 spirits company in the world. The Chinese consumer is crazy about cognac and, to a lesser extent, Scotch. Some bottles -- not even the most expensive ones -- go for a few thousand euros, so you can imagine the margins. It's insane! But good for the investor. A growing portion of the luxury goods produced in the world are sold in China these days. We also own Danone, which is the only large food company that gets 100% of its sales from healthy products. It does 50% of its sales in emerging markets, but it's only in about 50 countries, so it can still expand globally. The per capita consumption of yogurt is very small in a number of countries, including the U.S. Americans consume only a quarter of what Europeans consume in yogurt, so the U.S. is like an emerging market. Pimco's leadership has backed away from U.S. Treasuries, citing factors such as inflation. Has that affected your investing strategy? It's always something we keep in mind, especially when we're investing in consumer staples, because there will be higher raw material prices. We'll invest in companies that have the No. 1 or 2 market share because they'll be able to pass on a cost increase and do well in an inflationary environment. We don't want to invest in the No. 3 or 4 franchise because they'll be squeezed out by private labels. Where else are you finding values in the stock market? In the technology sector, there are stocks that have disappointed. Microsoft (MSFT, Fortune 500) is one of our top holdings. It's a fallen angel. The company used to have a high growth rate; now growth has come down, but it continues to generate a lot of free cash flow. And a lot of cash is sitting on the balance sheet, which management can use to do share buybacks. We think it's very cheap for a very unique franchise. Another company we're invested in is Gemalto, which is a Dutch company that makes chips for phones and banking cards, a growth industry in emerging markets. It also makes secure IDs and passports, which have a very high growth rate. Your fund has the ability to invest in all types of securities. Other than value stocks, what do you like? The largest position in the fund is gold, which we think is a very good form of protection against what can go wrong. We were encouraged by the fact that a lot of the central banks, especially in Asia, are big buyers. We think that's an underlying trend that's very favorable for gold.